The Porch plaza opened in November 2011, replacing what was previously an underutilized parking lane and plain sidewalk outside of the 30th Street SEPTA rapid transit, tram, trolly, bus and Amtrak Station, which is among the busiest train stations in the country with about 51,000 daily riders. 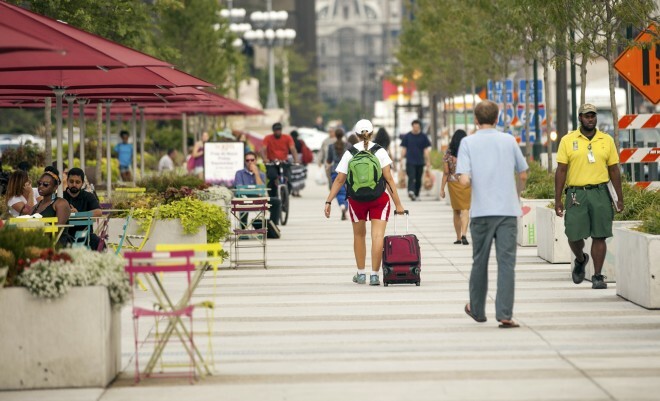 The large number of mass transit riders, pedestrians, and office workers near The Porch created high demand for public space in West Philadelphia. The Porch is within 1,200 feet of over 16,000 workers, including 4,300 federal employees across the street. The project was initiated by University City District, a non-profit created by area stakeholders to promote the district, and realized through collaboration between the public and private sector. The Porch is now an approximately 28,000 square feet plaza with movable tables, chairs, and umbrellas, and is hosts music performances, a weekly farmers’ market, and cultural events that draw neighborhood workers, residents, students, and visitors to the space. 50’ by 565’ sidewalk installed with flexible seating and lanes for pedestrians to walk. Replaced 32 parking spaces in two parking lanes, along with a circulating lane, and a narrow sidewalk with forlorn planters. There are numerous other surface parking lots and a nine-story, 2,100 spot parking garage nearby. Seating for up to 250 people, umbrellas, 68 planters, and 38 trees were added. The space is programmed daily with events, which has included miniature golf, concerts, a farmers’ market, public art, yoga, food trucks, and a beer garden. “The Porch” was named through a public contest. The Porch is a successful public space! Approximately 1,000 people lingered at The Porch daily on nice summer days in 2012. As many as 120 people use the porch at the height of day, far more than could have been served by 32 parking spots, with the highest number of users on Farmers’ Market days. Many more people walk through the space, with about 600 pedestrians traversing the length of The Porch hourly during the morning rush and 700 hourly during the evening rush. Many more pass on the porches periphery. Many times more pedestrians travel through The Porch than other nearby streets, and reflects the importance of the space for transit commuters. 95% of surveyed users said that they were more likely to spend time in the space as a result of the new design. It is one of the most densely used public spaces in the city. The Porch provides much desired seating. Of the nearly 25,000 visitors counted lingering in the plaza between April 2 and October 1, 2012, 80% were sitting. The Porch serves the vast majority of the area’s populace – workers, shoppers, and mass transit users. Over 93% of these users arrive by train, bus, trolley, bike or foot, indicating that the overwhelming area use and demand for space is not by vehicular traffic. Over 85% of surveyed users stated that they were using The Porch on their way to or from mass transit, or on a lunch or other break. The Porch functions as an inclusive place. Surveys showed that users of The Porch are highly diverse by age, income, travel mode, gender, and education. The Porch supports local businesses. 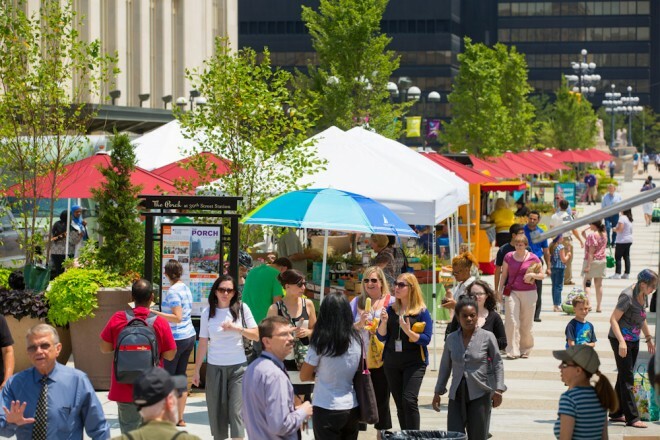 On one day in September, 2012, more than half of the 44 surveyed users eating lunch in the plaza had purchased their lunch from local food trucks. On another day, 79% of lunchtime eaters purchased their meal from the nearby businesses on 30th Street. There is also a seasonal farmers’ market in the space. Area vehicular operations function similarly to how they did previous to the street redesign. There are about nine acres of surface parking within a quarter mile of the site. 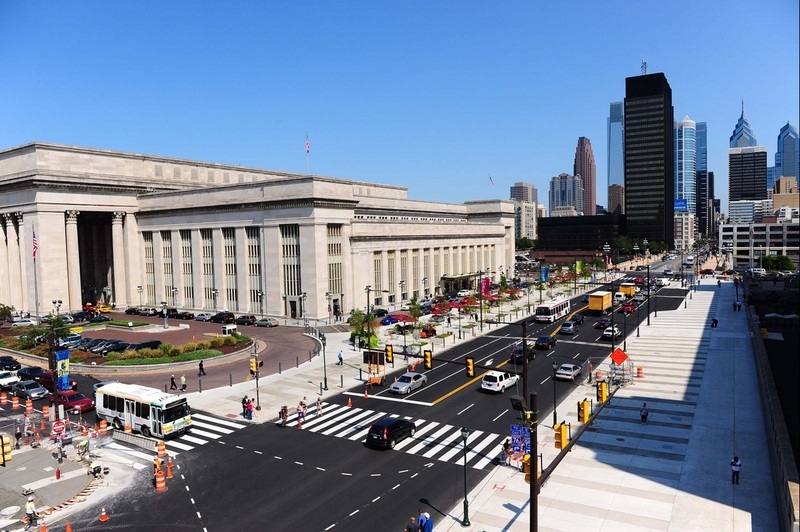 The remaining drop-off lane between the Porch and 30th Street Station, Little Market Street, remains underutilized with only about 75 vehicles using it per daytime hour, compared to about 24,000 daily vehicles on 30th Street and Market Street. This indicates that the change hasn’t displaced inordinate traffic to the Little Market Street, and that there is adequate drop-off space, supporting the notion that the previous parking lane was superfluous to the area’s functioning for vehicles. The comparatively high use of The Porch suggests the need for further pedestrian space, rather than parking, if further changes are made. Pennsylvania’s Department of Transportation was already renovating the nearby bridges, and created the sidewalk space, which was then programmed by University City District with advice and support by city agencies and politicians, Amtrak, Project for Public Spaces, and others. Guided by Project for Public Spaces’ “Lighter, Quicker, Cheaper” philosophy to experiment with or “beta test” the space. A second phase will include a permanent and capital-intensive design.